While not given the fanfare of Columbus Day, today in the United States is, in fact, Leif Eriksson Day. Leif Eriksson (other spellings include Ericson, Erikson or Eiriksson), also called “Leif the Lucky”, was the second son of the famous Norse explorer Eric the Red, who, after being booted out of Iceland somewhere around 980 A.D., founded a settlement in Greenland. According to the 13th century “Saga of Eric the Red,” Eriksson set sail from Greenland to Norway around the turn of the first century A.D. During his travels, it is thought he made a pit stop in the Hebrides where he hooked up with Thorgunna, whose father was a local chief; they had a son named Thorgils. Once in Norway, Eriksson was converted to Christianity by King Olaf I Tryggvason, who sent him back to Greenland a year later with orders to converts the settlers living there. 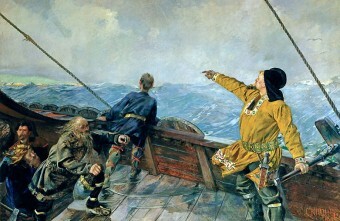 Historical accounts vary widely on Eriksson’s voyage to Vinland. According to the Eiriks saga. Eriksson ended up far off course when returning to Greenland and landed in North America instead. He called the area where he landed “Vinland” supposedly due to the abundance of wild grapes growing there, as well as the apparent fertility of the region. 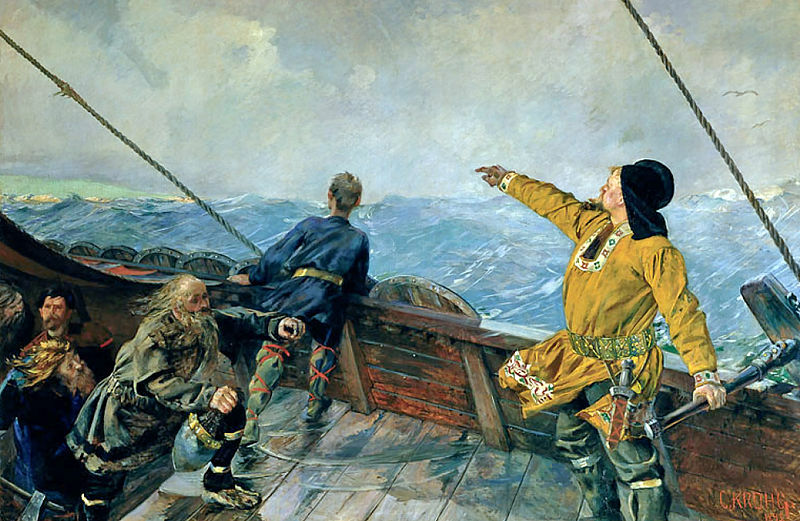 The Groenlendinga saga (or “Saga of the Greenlanders”), which most historians consider more credible than the Eiriks saga, contends that Leif Eriksson learned about Vinland from an Icelandic trader named Bjarni Herjulfsson. The trader had sighted the North American continent from his ship 14 years before Leif’s voyage there, but had not actually set foot on the land. Adding to all this uncertainty, the exact place where Eriksson landed is also disputed. The Groenlendinga saga states Leif made three stops at at Helluland (Labrador), Markland (Newfoundland) and Vinland. The exact location of Vinland has been hotly debated over the years, and has been identified as a variety of places along the north Atlantic coastline. Excavation in the 1960s at L’Anse aux Meadows on the northern tip of Newfoundland turned up some artifacts of what many thought to be the remnants of an 11th century Viking base camp, though others thought the area too far north to be the Vinland described in the Icelandic sagas. Whatever the case, there is no question that North America was visited by Northern Europeans in the 10th or 11th centuries due to these known Norse settlements, one of which was established in continental North America in the 10th century. The settlements were a failure in part, it appears, due to problems with the Native Americans, who the Norse called Skrælings. However, according to recent scholarship, the Norsemen continued to meet and trade with indigenous Americans, at least sporadically, even after the failure of the two colonies they setup. Not the dull oafs of legend and Capital One commercials, the Vikings even made a map of their North American conquests. The Vineland map is believed by some to have been made circa 1440, and demonstrates that at least some Europeans were aware of the existence of continental North America, well before Columbus set sail. In any event, after his stay in Vinland, Eriksson returned to Greenland and never returned to North American shores. Leif took over as chief of the Greenland settlement when his father, Erik the Red, died. His son Thorgils was sent by his mother to live in Greenfield with his father, but apparently was never popular with the people. When Leif passed away in 1025, his son Thorkel Leifsson succeeded him as chief. In the late 19th century, many Americans of Nordic descent began celebrating Leif Eriksson as the first European explorer to discover the New World. In 1925, to honor the 100th anniversary of the first official group of Norwegian immigrants to arrive in the United States, President Calvin Coolidge told a Minnesota audience that Leif Eriksson had been the first European explorer to discover North America. Finally, in honor of this intrepid explorer who journeyed to the shores of North America hundreds of years before Columbus, Congress approved a public resolution in September 1964 that gave President Lyndon B. Johnson the authorization to declare October 9 as “Leif Eriksson Day,” as it is today. There is increasing evidence, and speculation, that the Americas were visited by Muslim and Chinese explorers long before the “Age of Discovery” in the late 15th and 16th centuries. Although still somewhat up for debate, there is evidence that a Muslim sailor, Khashkhash Ibn Saeed Ibn Aswad, traversed the Atlantic and landed in the New World in 889 C.E. In 956, famed Islamic historian, Abul Hasan Ali Ibn Al Masudi, created a map from his research of this journey that depicts an unknown landmass where America is located. Other voyages to the New World chronicled in Muslim histories includes that of Ibn Farrukh, who seems to have visited islands far to the west of the Canaries in 999 C.E. Proponents of the Muslim exploration theory repeatedly turn to an intriguing map drawn in the early 16th century by the famous cartographer, Piri Reis. Reportedly copying from ancient documents found in a Turkish library, it is widely accepted that Reis created the map in 1513. Even though this is after Columbus “discovered” the New World, the Piri Reis map depicts the accurate placement of islands and landmasses far before they were visited and mapped by Europeans. In fact, it shows the Andes Mountain range, which was not “discovered” by Pizarro until 1527.